Parent-Child Interaction Therapy (PCIT) is an evidence-based treatment for children with disruptive behavior disorders and their parents. Given the versatility of PCIT and the high prevalence of disruptive behaviors among children with autism spectrum disorder (ASD), recent evidence suggests potential benefits of using PCIT in children on the autism spectrum and their families. While applied behavior analysis (ABA) is often described as the gold standard treatment for children on the spectrum, PCIT shares many theoretical and conceptual similarities with ABA and other evidence-based treatments for ASD. This chapter highlights these overlapping elements and describes specific components of PCIT that may add to existing services for children with ASD. Although PCIT in its present form may not meet all the needs of children with ASD, it has some considerable strengths when compared to current treatments for autism. 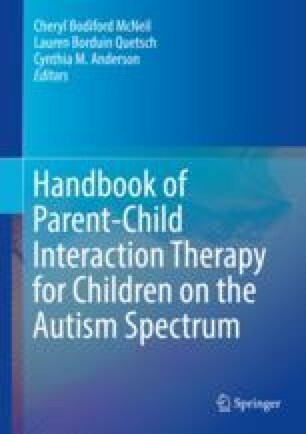 This chapter argues for the usefulness of PCIT as a gateway treatment prior to beginning a more intensive intervention and as an alternative intervention for those who may not have access to more intensive, ABA-based therapies. Limitations, caveats, and future directions are also addressed in this chapter. Centers for Disease Control and Prevention [CDC] (2018b, May 3). Autism spectrum disorder (ASD). Retrieved from https://www.cdc.gov/ncbddd/autism/facts.html.